A couple of months ago, I fell sick. For an entire week, I could not stop throwing up. I could not hold in even a sip of water. Because my stomach was empty, I found myself by the toilet bowl, gagging nonstop although there was nothing to expulse. My husband, Firdaus, would rush towards me to rub my back, but that made me retch more. It came to the point where he no longer knew what to do. He would just stand by my side to show his support while I was in the toilet. It was horrible. I whined, “Bee, I want this to stop.” I cried a lot and felt super sorry for myself. It was then when I realized how profound Prophet Ayyub’s story is. He started out blessed with immense wealth, a wonderful wife, many children and lots of friends. In just a few years, he lost his wealth, his precious children died, he suffered from a debilitating skin disease, and his beloved friends abandoned him. His skin condition was so awful that he suffered severe pain and was emaciated. Yet, Prophet Ayyub persevered. He never stopped loving Allah. Unlike me, he did not complain at all. Instead of feeling unfortunate, he patiently endured, with full focus on Allah. Prophet Ayyub knew that everything that comes from Allah is good. When Allah gave him good, he was immensely grateful, and that was good for him. When Allah tested him with trials, he practiced a beautiful patience, and that was good for him too. Subhanallah. He went on to speak to Allah. He said, “I have been afflicted with great distress: but You are the most merciful of the merciful.” [Surah Al-Anbiyaa, 28:83]. How amazing was his character? How clean was his heart? If I were in his position and heard Firdaus lament, would I have been able to respond the same way? Our prophets’ stories are not bedtime stories. They are not meant to put you to sleep. In fact, I’ve come to realize that their accounts are meant to wake us up, from our mindless sleepwalking through life in Dunya. They open our minds and hearts and teach us great lessons. 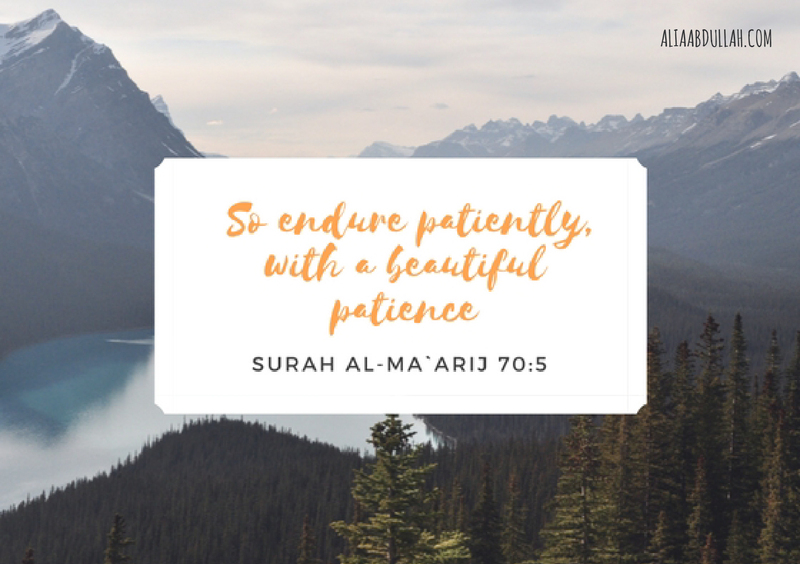 Through Prophet Ayyub, I learned that sabr is not only patience. It’s also endurance, forbearance, and steadfastness. It’s how he never lost faith in Allah, even after all his possessions and riches were taken away. It’s how he practiced husnudzon even after 80 years of pain. It comes from a position of mindful strength, not meekness. Sabr is how Prophet Muhammad SAW did not retaliate in Taif, when he was insulted and pelted with stones. It’s how Khadijah bint Khuwaylid (radiAllahu anha) stayed by Prophet Muhammad SAW’s side through the years of poverty, ostracization, and danger. It’s how Asiya (radiAllahu anha) rejected the Pharoah and the status that she had as a queen to be true to her belief in Islam. It’s how Maryam gathered strength to obey Allah and remain silent, while the villagers were disparaging her and her baby. Sabr is not about passively waiting. Sabr is actively surrendering to the will of Allah. Hasbunallahu ni’mal wakeel. Allah (Alone) is Sufficient for us, and He is the Best Disposer of affairs. Most of us know this by heart and can recite it at will. However, how many of us have internalized this? Will we be able to deal with the trials and tribulations in our lives with sabr that is beautiful? I’m currently experiencing the same thing — non-stop gagging. And at one point of time I felt like giving up because I was too tired of having to rush to the toilet. I could feel my body feeling weaker and was crying because its just so painful. But just as I was about to give up, I received a notification to your post. Allah’s plans are indeed beautiful, for He has brought your post as a reminder. A perfect timing. SubhanAllah. May Allah bless you always and give us all health that’d help bring us closer to Him, giving our 100 in performing ibadah. Ameen!